Born in Indian Orchard Massachusetts in 1894. With his father’s permission he left the family farm business to Dartmouth where he was a 3 year starter. After graduation he headed west looking for wide open space and ended up finding work loading beef into railroad cars. He met Ed Shaw who had been the captain of the University of Nebraska team. Shaw told him that a new professional football league had formed in Canton Ohio and that the nearest team was located in Rock Island. Ed hopped a train Friday night and took a Spalding Guide with his information and picture to Walter Flanigan to ask for a tryout. Walter saw that he had played at Dartmouth and said, “We’re looking for men like you”. From then on Ed would travel out every Friday night, practice with the team Saturday and play on Sunday. Ed played with the Independents for 3 full seasons. 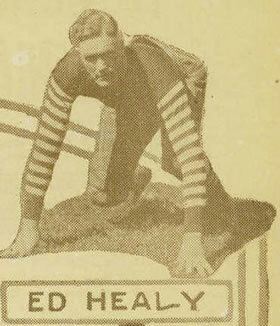 Following a game against George Halas and the Bears, Halas purchased Healey from the Independents for $100. The purchase is known as the first ever player contract sale. Ed went on to play for Chicago for five more years. He was listed as first team All-Pro four of those years and is listed on the 1920s All-Decade team. He was inducted into the Hall of Fame in 1964.